The tokidoki universe is a world of paradoxes; cute little creatures with sometimes prickly or outre attitudes. Take for instance the Cactus Friends – cuddly animals that can’t be cuddled – or the 12 lions and lionesses of the soon-to-be-released Royal Pride family. The crown capped ladies are decked for a shopping spree with their perfect pink poodles by their side, while their maned male counterparts are equipped with crowbars, nunchuks, and ouzi’s, ready for a smash and grab or back alley rumble. Yikes! Todidoki godfather/designer Simone Legno spun up his Japanese inspired fantasies online about 11 years ago which drew the attention of the Hard Candy cosmetics company. A partnership proposal brought Simone from Rome to LA in 2003 and launched the ever expanding tokidoki line of apparel, make-up and novelties. In addition to the newest Cactus Friends, (Porcino the pink piggie and yellow snuggie zipped rabbit Truffle) tokidoki is offering several Marvel Avengers tie-in’s in their spring 2012 line. 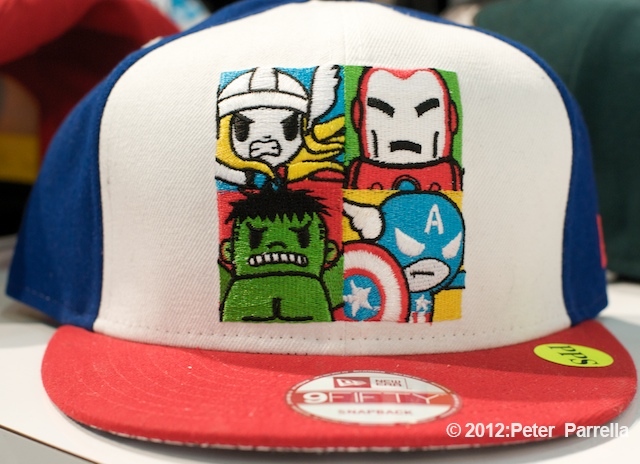 Along with iPhone covers and skate-decks there’s a fun set of baseball caps with embroidered “doki-ized” superhero designs. This includes a winged Captain America cap, Iron Man, as well as the assembled Avengers. My favorite is the awesome Doctor Doom design. Each hat has a unique under-the-brim graphic that ramps up the visual impact, and – yes – there are brim labels for the sticker afflicted. Also on display at the tokidoki Toy Fair booth were Marvel themed Frenzies, little lanyard strung collectible charms that will be sold in blind boxed displays. Be sure to check the tokidoki web site for a look at their diminutive punk rockers and classic Moofia designs. I want those marvel themed stuff!